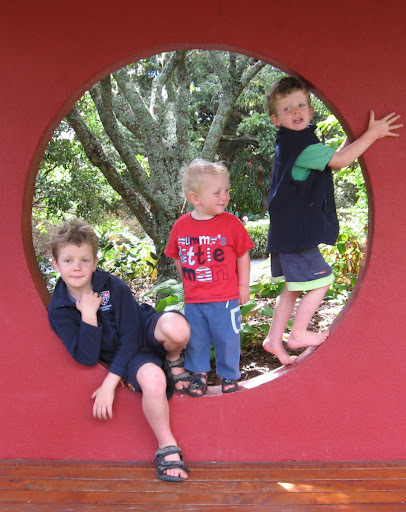 You can see them on the right as, despite those innocent looks, they scheme and plot all sorts of crazy insect gathering plans in the red circle. Zach was so intrigued he popped a likely looking caterpillar into his pocket. What a cunning scallywag! He is very lucky the Garden Ranger didn't find him or he would have found himself inside a terrible deep dark dungeon where he would never have seen the light of day again. By and by Zach was going on a trip to London and the caterpillar decided to go too because he had cousins there; his cousin Hairy Molly was one he particularly wanted to visit. He settled down for the long trip and when Zach finally reached his cousin Freddie's house the caterpillar went outside to find his cousin Hairy Molly. 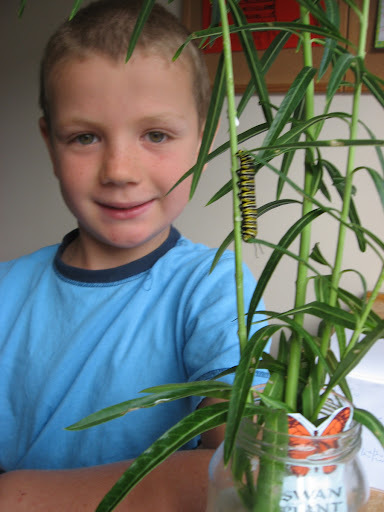 Zach's caterpillar and Hairy Moll said a big hello to each other and after a few more gobbles on a few more swan plant leaves they turned into big beautiful butterflies and roamed the world together exploring all the botanical gardens they could find. All good here, just busy with the crew, always running. almost exam time again. Wont let another week go by without catching up with you. Next Next post: Boys. Men. Cars. Brrrrmmm….